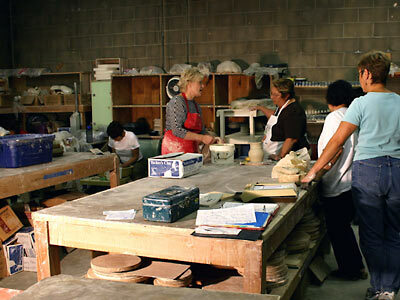 Morning and evening adult classes are offered year round at the Stoneware Studio. 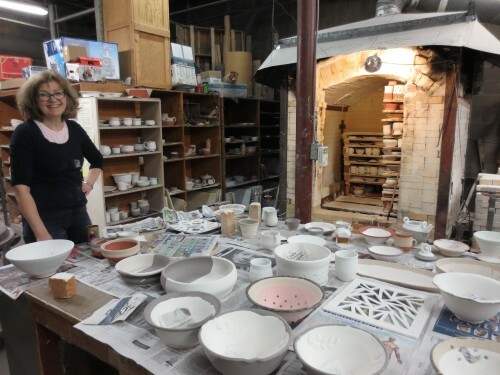 The lessons emphasize throwing on the wheel and are tailored for all skill levels, from beginning to advanced. Note: For more specific information on our REGULAR SESSION and our SUMMER SESSION classes click on their links below. The regular session operates from September to June where students pay at the beginning of each month, and continue for as many consecutive months as they are interested. For some this has become years, but for others, attendance is for a few months only. New students are contacted when someone quits, and must commit to two consecutive months as a minimum. The summer session, with three or four different classes, is offered as an eight week session during July and August. This is a great time for new students to be introduced to throwing. A waiting list is maintained for anyone wishing to join one of our classes. To get on the list email contact@stonewaregallery.com or phone the gallery at 204-475-8088 (preferably on a Monday to speak to either Valerie or Kathryne). Please provide your phone number and email address, and state whether you would like morning, evening or summer classes.